A DEXA scan is a bone mineral density test that can tell you how healthy your bones are—but who should have it? A DEXA scan test that comes in at -2.5 or lower reveals osteoporosis in a patient. Research suggests that not enough women who should be getting a DEXA scan are actually receiving them. One 2015 study analyzed the health records of around 51,000 women and found that the DEXA scan was underused in women at increased fracture risk, including women aged 65 years and older. “Meanwhile, it was common among women at low fracture risk, such as younger women without osteoporosis risk factors,” said study author Anna Lee Amarnath, MD, of the University of California, Davis. Why Would You Need a DEXA Scan? It’s this incongruity that underpins the question of who should have osteoporosis screening and who should not. Osteoporosis translates as ”porous bones.” That means the micro-architecture of your bones is altered to the extent that they lose their density, becoming less strong and more prone to fracture. 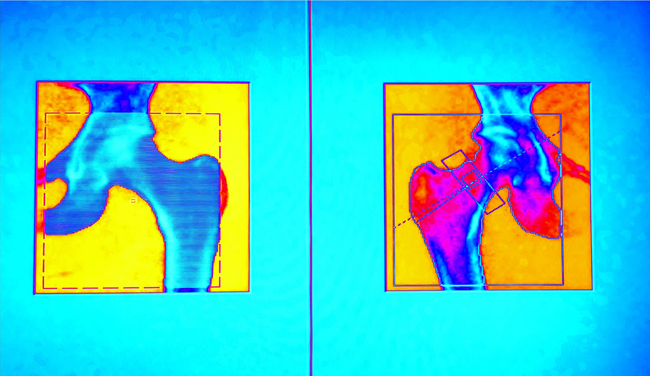 But how do you know whether this process is happening to you, and how are osteoporosis and the therapies designed to treat it monitored over time? This is where a DEXA scan comes in. The information it provides can help you protect yourself against potentially serious bone fractures. A DEXA scan measures the density of the bones in your spine and hips. The scan is fast, and you shouldn’t need to undress (though you will have to remove any metal, such as jewelry, keys, and belt buckles). If you’ve been concerned after reading reports about the level of radiation used in tests like DEXA scans, X-rays, and computed tomography (CT) scans, don’t panic—a dexa scan exposes you to a very low dose of radiation. You receive it in two beams: one absorbed by the soft tissue in the area being tested and one absorbed by the bone. The United States Preventive Services Task Force (USPSTF)—an independent panel of experts—recommends screening for osteoporosis in women aged 65 years and older, and in younger women whose fracture risk is equal to or greater than that of a 65-year old white women who has no additional risk factors. You also should ask your doctor about having a DEXA scan if you weigh less than 154 pounds, if you have a family history of osteoporosis, if you sustain a fracture after age 50, and if you smoke or regularly drink three or more alcoholic beverages each day. Health conditions like hyperthyroidism (overactive thyroid), Crohn’s disease, and some medications (including corticosteroids, some antidepressants, and proton pump inhibitors) also may weaken your bones. If you fall into any of these categories, speak to your doctor about having a DEXA scan. antidepressants, bone, bone density, bone density measurement, bone health, corticosteroids, dexa scan, dxa scan, for osteoporosis, health, health news, history of osteoporosis, hyperthyroidism, low bone density, normal bone density, osteopenia, osteopenia symptoms, osteoporosis, osteoporosis -2.5, osteoporosis 3, osteoporosis in women, osteoporosis osteoporosis, osteoporosis risk, osteoporosis risk factors, osteoporosis screening, radiation, strength, t score, thyroid, university health news, what is osteoporosis, x ray absorptiometry, your bones. I thought you might be interested in this article on https://universityhealthnews.com: What Is a DEXA Scan?